This case shows one of the dental conditions that is very familiar to anyone who has had a history of grinding and clenching. One of the complicating background factors of this case is a history of dry mouth. Dry mouth tends to accelerate erosion because there is not adequate salivary flow to flush off acids and sugars from the food we eat. Above: Images 1 and 2 show wear through the enamel and into dentin, which are scooped out. Below: Images 3 and 4 show the (4) lower anterior teeth with Obsidian-type all-ceramic crowns. Restoring the tips (incisal edges) of these teeth with composite was completed a few years ago. The composites were a stop gap restoration to slow the continued erosion. 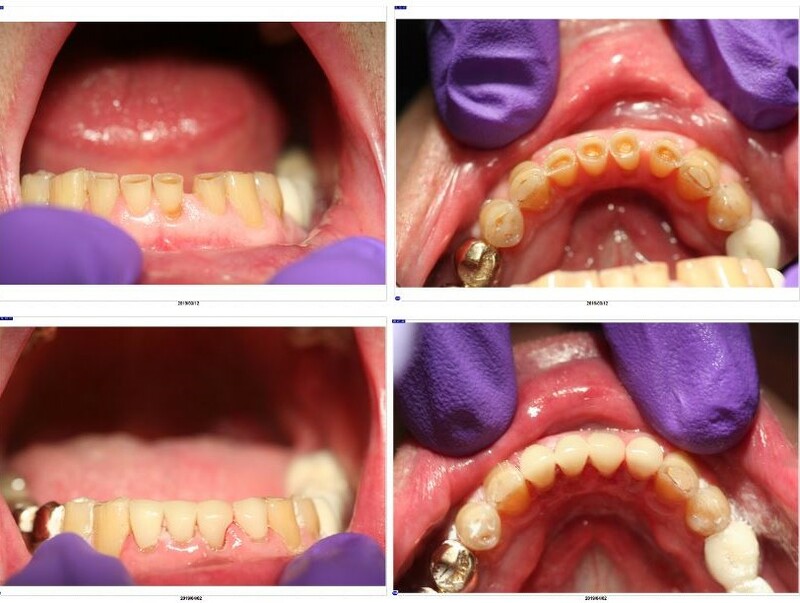 Because the teeth continued to erode around the edges of the composite, the composites finally fell out and a more definitive restoration was required to give these teeth their best chance at long-term retention. Without treatment these teeth would continue to erode until they became too short to receive crowns. We were able to restore these teeth with all-ceramic crowns, in office same day, using the newest electric mill, TS150e. We upgraded to this unit as of January 2019 to improve our milling capability. In this case, you will notice, we completed 4 teeth in one sitting, without having to put the patient in temporary crowns. If you need to repair damaged teeth, give us a call at 512-454-2744 or book an appointment online.